Black sweater knit long sleeve tagless shirt with purple, white and gray plaid back. 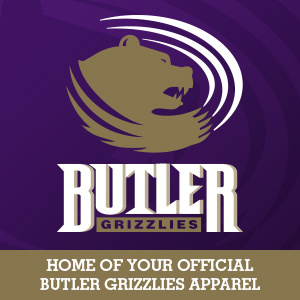 "Butler Grizzlies" and the Grizzly Power Head imprinted in cream on the upper left front. Shirt tail hem. 24% polyester 22 % rayon 31% cotton 5 % spandex front & sleeves. Back 100% rayon.